At LIBERTYAIR, we strive to make heating and cooling your home more convenient. If you need to replace your current heating system, or want to choose the type of system installed in your new home, then ask our technicians for help in determining the best heating solution. Need a new heater for your home? Let us help you choose! When it’s time to replace your home’s heater, or if you are installing a heater in a newly constructed home, it’s important to consider price, convenience, the amount of heating and cooling needed for your home, and whether you are interested in energy­-efficient models. Price: For many homeowners and property owners, the cost of a new heating system can make all the difference. If you have some room in your budget, you may consider energy saving models which can cost more upfront, but will save on energy consumption in the future. Heat pumps, electric heaters and gas furnaces will all vary in price based on the type of system and its heating capacity. Convenience: If you’re in need of a low-maintenance heating and cooling system, then convenience may outweigh pricing and energy saving models. Energy Savings: Older heating and cooling systems rarely have energy saving features included. So when it’s time for a new model, you may want to choose a model that is energy efficient. Before you choose a furnace for your Florida home, check out these Common Winter Heating Problems so you can be ready before the temperatures drop. Heat pumps have become increasingly popular with homeowners in Gainesville and across Florida. Despite the name, heat pumps actually provide both heating and cooling in a home. During Florida’s hot and humid months, a heat pump pulls warm air from inside your home and pushes it outside. Then, coils filled with refrigerants cool air and pump it into your home. To heat your home in the winter, heat pumps pull cool air from outside, heat the air using water­based or coolant-­based systems, then pump the warmed air into your home. Heat pumps can be used in homes and offices with or without ducts. 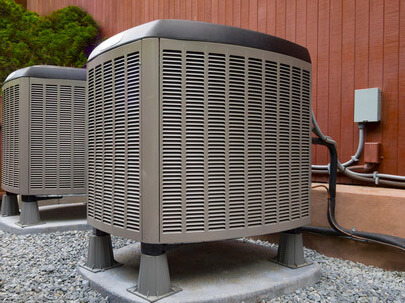 Heat pumps are considered more efficient than other types of heating and cooling because they remove the warm air before pumping in cool air. Gas furnaces are less versatile than heat pumps as they only provide heating and not cooling. However, natural gas furnaces can heat a home more quickly than other types of heaters, and they deliver air that can be 25 degrees warmer than air circulated by electric heaters. There are even features that newer gas furnaces offer which can improve heating efficiency. Look for gas furnaces that include electronic spark ignitions, which limit fuel waste and condensing furnaces that can recapture a percentage of heat from water vapor. Electric heating and cooling systems are very popular in Florida as a large percentage of homes are built with central air access. Electric forced air heaters generate heat via heating elements, or high­resistance wires. A fan or blower then distributes the heated air through the ductwork and vents in your home.